The concept behind ventilation is pretty simple. Ventilation allows air to flow through a system of intake and exhaust. 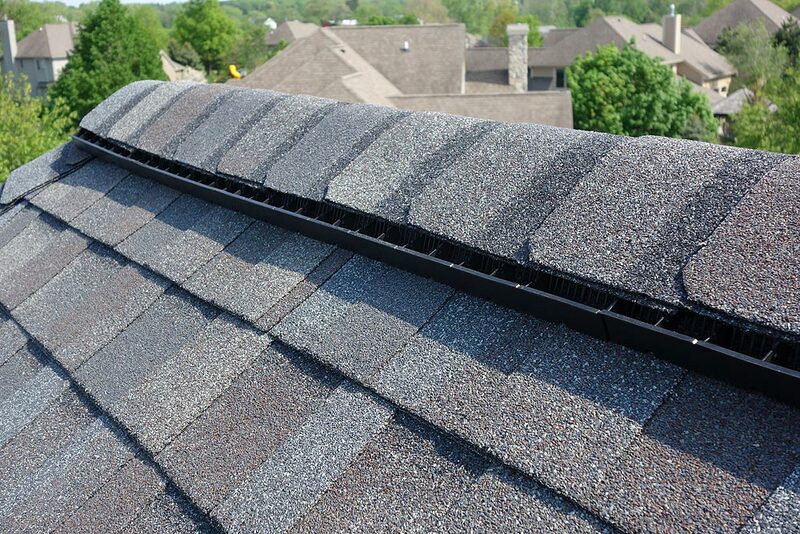 Effective attic ventilation provides year-round benefits for all types of roofing systems. Ventilation creates cooler attics in the summer, drier attics in the winter, protect against damage to materials and structure, aids in reducing energy consumption, and helps to prevent ice dams. Factors such as code requirements, regional climate and roof and ceiling designs all need to be considered when venting your roof, meaning every ventilation is unique to the home. Exhaust vents allow heat to escape. The most common type are ridge vents, which are installed at the intersection of two roof planes. They are typically made of a high-impact copolymer. Exhaust vents are installed underneath a final layer of shingles to give the roof a seamless look. There are also visible exhaust vents which include roof louvers, gable louvers, and wind turbines which are all mounted on the outside of your roof. All of these options do not use electricity, but there are types of vents that are powered by electricity. Power attic ventilators, which run on a power source, are an exhaust vent option for certain roof designs or areas without much wind. Intake vents are also made of copolymer material and are located at the edges of your roof. They can be installed at the eaves under the soffit, at the drip edge, or under the shingles at the roof’s edge. Intake vents work with ridge vents to allow cool air to enter the attic space, thus forcing warm air out. When the temperature increases outside, we all want to stay cool inside. However, buildings with poor ventilation can have a massive buildup of heat up to 140°F on a 90°F day in the summer. An overheated attic, combined with moisture can cause a number of problems. This includes damage to roof decking and roofing shingles, which can become distorted and deteriorate prematurely. Heat that’s absorbed in the attic can also radiate into the living space causing air conditioners, fans, refrigerators and other appliances to work harder. As a result, energy bills can increase. A properly ventilated roof allows heat to escape, therefore reducing the workload on your air conditioner. Have you seen icicles build up on the edges of your roof? This is called ice damming. Ice dams happen when heat from inside your attic combines with heat from the sun to melt snow and ice on your warm roof. As a result, water runs to the edge of the roof and begins to refreeze. As more ice and water build up on the edges of your roof, it can back up underneath your roofing materials. This can damage your whole roofing system, your attic and even the walls of your home. Proper ventilation helps heat escape before it has a chance to melt snow and ice on your roof. In the summer, the temperature in your attic can nearly double without proper ventilation. High heat can damage your shingles from the inside out. An evenly vented roof allows hot air to escape keeping your roof and attic cooler. A properly ventilated roof also protects every aspect of the roof structure by releasing any moisture that might otherwise collect. A roof system that does not have adequate ventilation will become a moist breeding ground for mold, mildew, and fungus. Mold can find its way into your HVAC system and also lead to wood rot in the attic and roof supports. Any metal materials will rust or even break with prolonged moisture exposure. Proper ventilation begins with proper installation. Extend the life of your roof with proper inspection, maintenance, and repair and trust the professionals at Titan’s Roofing. Let us carry the weight. Call today for a free estimate.